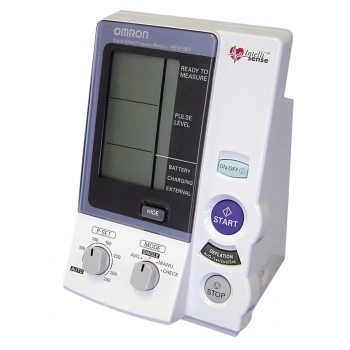 Omron Sphygmomanometer HEM-907 Kit compiles with AAMI standards for accurate and automatic measurement of blood pressure. Integrated with the fuzzy logic technology, HEM-907 easily determines the perfect cuff inflation level entirely based on the fluctuation of blood pressure and the arm size of the patient. Features like automatic deflation and push button operation make clinical staff training easier. It is a highly preferred device as it operates quietly and is ideal for use at night. HEM-907 Kit is integrated with dual measurement modes including automatic and manual mode. In automatic mode, the cuff automatically inflates to an optimal level according to the patient's condition. In manual mode, the device measures helps blood pressure with the use of a stethoscope.